Though the Ludhiana Municipal Corporation claims to be the richest civic body in the region, it has failed to release funds for the maintenance of parks in Sarabha Nagar here. The Congress is a house divided in the city. The local leaders are invariably found indulging in leg pulling and sabotaging party programmes. The division in the party was amply demonstrated on November 18 when the reception arranged for the Punjab Pradesh Congress Committee president, Mr H.S. Hanspal, proved a big flop and the president refused to appear at the venue of the reception before the empty chairs. After the November 18 Congress rally failing to draw crowd the continuation of Mr K.K. Bawa and Mr Gurdev Singh Lapran as district presidents of Congress unit of Ludhiana (urban and rural) has become doubtful as the Punjab Pradesh Congress Committee (PPCC) President is reportedly not happy with both of them. For the inmates of the Ludhiana Borstal Jail, it was an entirely different encounter, also an easy one. Perhaps, for the first time, their cricket team, Ludhiana Borstal Jail Angels, was playing against Ludhiana Devils. The match was played inside the jail complex early here today. Not only about 200 other inmates and the jail staff, but also crowd from nearby watched the match from rooftops. Revamp of dist admn on cards? Congress workers and leaders yesterday reportedly protested to the Chief Minister, Capt Amarinder Singh, that they were allegedly being ignored and ill treated by officials . 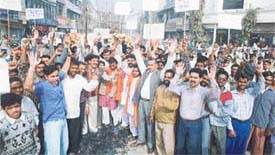 Activists of the local unit of the Shiv Sena (Bal Thackery) took out a procession through various parts of the city in protest against the increase in terrorist attacks on civilians and security forces, adoption of a soft approach by the Mufti Mohammad Sayeed government towards militants and the revocation of POTA in Jammu and Kashmir. 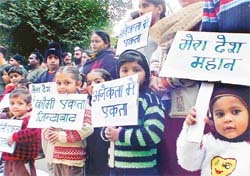 Ludhiana: The general secretary of Kidwai Nagar Welfare Society, Mr R.R. Katyal, claimed on Sunday that the Administrator of Ludhiana Improvement Trust (LIT), Mr Raminder Singh, had passed the orders for the execution of registration deeds of trust flats and kothies constructed in the Kidwai Nagar area. The Division No 6 police has registered a case under Section 306 of the IPC on the statement of Manjit Kaur, wife of Charan Singh, who allegedly committed suicide yesterday in his Guru Arjan Dev Nagar house, against the estranged son of the deceased and three members of his in-laws' family. The police has registered a case of murder against Mohan Kumar (33), a resident of Shivaji Nagar, for killing his two-day old son in a fit of rage at his house yesterday. According to information, Mohan Kumar, who is a scooter mechanic, had sent his wife to a relative's house after she had become pregnant for the second time. Gujranwala Guru Nanak Public School has its roots in Khalsa High School Gujranwala, established in 1889. Feeling the need for an institution which laid equal emphasis on moral and academic education, the Khalsa Educational Council (Gujranwala), Ludhiana, started it again in January, 1985. 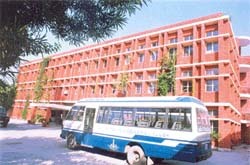 The school is built near the beautiful and lush green environments of Rose Garden. The Department of Home Science Extension Education and Extension Education have been merged and would work as one department. The new department would be known as Department of Extension Education and come under the College of Agriculture of Punjab Agricultural University. Students and staff of Gupta Model High School, Club road, celebrated founder’s day of the school by organising a function here today. 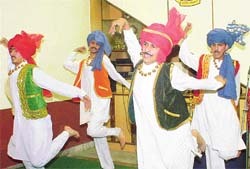 Mr Rakesh Pandey, Minister for Printing and Stationary, was the chief guest and Mr Bachittar Singh, DEO, Ludhiana, was the guest of honour on the occasion. Rupinder Kaur and Sukhbir Singh were adjudged best athletes among girls and boys, respectively, in the annual athletics meet of Sutlej Public Senior Secondary School, Rahon road, here yesterday. Ravi Inder Singh and Navkaran Singh were declared the best athletes in the section of boys above the age of 14; and Rupinder Kaur won this title in the girls’ section of this age-group in the two-day 26th Annual Inter-house Athletics Meet of the Sarabha Nagar Guru Nanak Public School here yesterday.